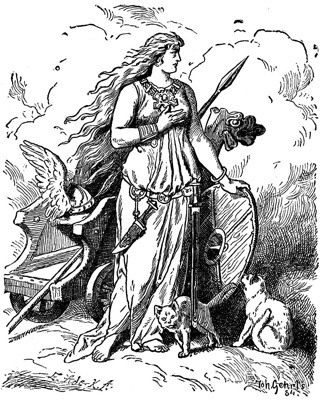 Freya, or Freyja, Queen of the Valkyries and Queen Mother of the Vanir, is both a goddess of love, peace and sexuality, as well as the ruler of war and death. As a goddess of peace, she is the spirit of the Earth’s fertility, as she is always there when Spring has awakened, and removes herself from earth in the Fall and Winter. As one of the Vanir, she was a giver of magic, and as such, she taught women chosen by her, magic songs to allow them to see into the future. As Queen of the Valkyries, she clothed herself in a falcon-feathered cloak and her amber necklace, donned a war helmet and carried a spear. As she drove her cat-drawn chariot of gold, she would claim the spirits of those who had fallen on the battlefield and bring them with her to her palace, in Folkvangir, in Asgard. Those whom she chose, would live with her and their afterlives were filled happiness. Those whom she did not choose would be escorted by her Valkyries to Odin. She would ease the transition of the deceased to Valhalla. Although she was married to Od, the god of ecstasy, she took many of the gods as her lovers. her people. This necklace became Brisingamen. Freya’s necklace is what some Norse still call the Milky Way. Brisingamen was stolen from Freya by Loki, who turned himself into a flea, and while she slept, bit her on the cheek. This caused Freya to turn and allow Loki to remove the necklace. Loki brought the necklace to Od, as proof of Freya’s promiscuity. Od disappeared without a trace. Freya donned her feather cloak and searched the world for him, all the while weeping tears of gold. She searches for him still. Love is in the air. Yes, a very cliche saying, but one that Freya would agree with always. 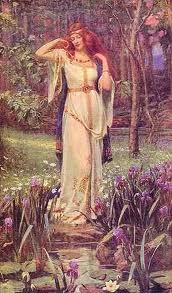 She is the Norse goddess of love, and enjoys getting arrangements of flowers and dancing to music. Along with the prettiness she was also a warrior goddess of the Valkyries. On her missions as the leader, she would ride on her chariot of two blue cats across the sky, creating what is now called “the northern lights.” When she got to the war battle field, she would claim the souls of the bravest warriors who died, and bring them back with her to rest in perfect peace. A very kind women, she would also ask their wives to come with her as well. With her sparkling personality and charming toughness, the strawberry-blonde defiantly attracted the attention of many men. One in particular named Od, who was the other leader in the Valkyries. Freya fell hard for him, and the two were soon married. Until one day Od disappeared, a mystery to everyone. Freya was outraged and upset, so she cloaked herself in rave’s feathers and flew off to find him. When she did she found him as a horrible sea monster, but she loved him so much nothing could get in her way. Soon after she found him, he was suddenly killed, giving Freya no time to stop the incident. Freya was blinded by anger and wanted to kill whoever murdered such a noble God. Before that could happen Od was sent to Valhalla, where he could have occasional visits from Freya so the two would be together for eternity. On a Friday (the day named after Freya herself) take a rose quartz crystal and recite an evocation to Freya of your choice, to be with you as you charge it, for love and luck throughout the year. Carry the stone with you in a safe place and make sure to charge it every once and while. Freya is very compassionate so always know she is never far from your heart. Another note, she is also helpful if you are experiencing relationship problems. Freyja (also known as Freya) was one of the major goddess of Norse mythology and leader of the Valkyries. She was the goddess of love, fertility and beauty. She is also known as the Goddess of war, battle, death, magic, prophecy and wealth. She could be seen as the counterpart to Rhiannon and looked upon as the Lady. It is thought that the day of “Friday” was named after Freyja. Freyja was married to mysterious God Od, who is sometimes associated with Odin. One of the myths associated with this is that Od left her and as she searched for him, she cried tears which turned to Gold. This is known to be where the world got its Gold (and also its Amber). Once she found him, Od saw her beauty and came back to her. As one of the major Norse Goddesses, Freyja had a lot of responsibility. She helps with childbirth, the seasons, cats, Seers, war, death, magic, prophecy and love, holding a Venus like quality. As much as Freyja had a softer quality, loving beautiful flower arrangements and romantic music, she also was the Goddess of War and Death. When she rode into battle with the Valkyries, their armor will flicker with light, which became known as the Aurora Borealis, or Northern Lights. Freyja could claim half the bravest souls in battle. She would actually walk onto the battlefield to collect their souls and bring them back to permanent rest and relaxation and being a generous woman, she also invited their wives and lovers to return with them. The other half would be gathered by Valkyries, lead by Odin, and brought back to Valhalla (the “otherworld”) to also live in rest and relaxation. 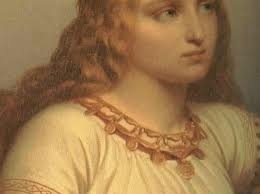 Part of her irresistible nature was the necklace Freyja had (the “necklace of desire”) known as the “brisling” or “brisingamen” that she received in exchange from four dwarfs who rescued her when she lost her way home in a snowstorm. When she offered to pay them in Gold for her room and board after the storm subsided, they countered by asking her to spend the night with each one of them, who were aptly named “North”, “South”, “East” and “West”. She usually would have turned down an offer to spend four nights with four dwarfs, however, the myth is once she saw the necklace, she had to have it and they would only accept payment of being with her. When the storm subsided, Freyja left with the necklace. At one point, the necklace is stolen by Loki (the “trickster”) and Heimdall (also known as Hemidallr) battles Loki to get it back for her. Freyja also had a cloak of falcon feathers that would help her transform into any bird and also help transit between the worlds. Cats were also sacred to her and two large blue cats that were gifts from the God Thor rode with her on her golden chariot as she went on her daily travels. Right now, Freyja is also very important as she watches over the souls of fallen soldiers. She can be also sent to watch over those who are at war and helps keep things in balance. You can work with Freyja when you are working on having harmonious relationships, including relationships to a mother or children. You can also work with her in beauty magic and ways to create self love. 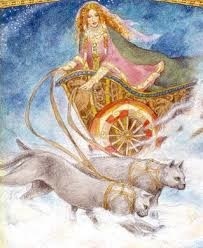 Freyja also was a powerful warrior so ask for her help with your own battles. If you have soldiers in war right now, ask for her to watch over them. Remember, Freyja is beautiful and compassionate but also powerful and a sorcerer, you are also many aspects within the same person. Embrace all the parts of you as Freyja has done.